We all look at ourselves in the mirror and immediately criticize parts of our body. It has become second nature, right? Now imagine instead of thinking those negative thoughts, they were recorded on paper for you to read every day, or spoken out loud by someone else. Would your perception about those thoughts change? Would you be horrified at the amount of negativity coming out of someone else’s mouth? That is the premise of a very clever new campaign from Dove France. This is the brand that has successfully been infiltrating our culture for a decade with confronting the way we talk about body image, and tried to implement more positive and affirming tools for women. In the video below we see two female actors being given lines to say in a staged scenario where they will sit in a coffee shop and converse using only the negative thoughts of real women. The actresses even comment to the filmmakers as they look over the script how awful some of these lines are! As they are filming and sitting in the coffee shop, onlookers and customers nearby are shocked to hear such negative and mean words being spoken by the two women, seemingly to each other. But when the onlookers are told what the deal is, they are even more shocked to realize that the words being spoken are words they have said to themselves. The campaign wants us to realize how impactful our words are, even to ourselves. If we continually allow a negative monolog to run non-stop in our subconscious, we are kidding ourselves to think we would think positively about our bodies. Like with any self-improvement techniques, it has to start from within. 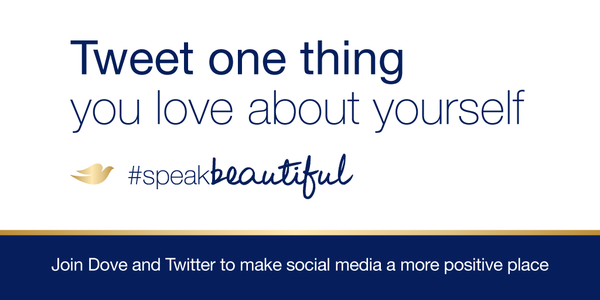 So Dove wants you to make a conscious effort to say #onebeautifulthought to yourself each day, and share it publicly using the hashtag to make it that little bit more real. It’s easy to let bad habits continue without keeping them in check. 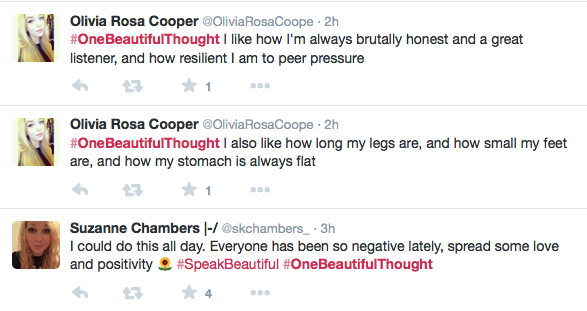 But do we really want to spend our whole lives berating ourselves for the way we look? Or do we want to live confidently knowing our appearance doesn’t dictate our worth, but we are happy with who are?